This simple tool allows Chinese language teachers to quickly create sentence translation worksheets for advanced Chinese language learners. 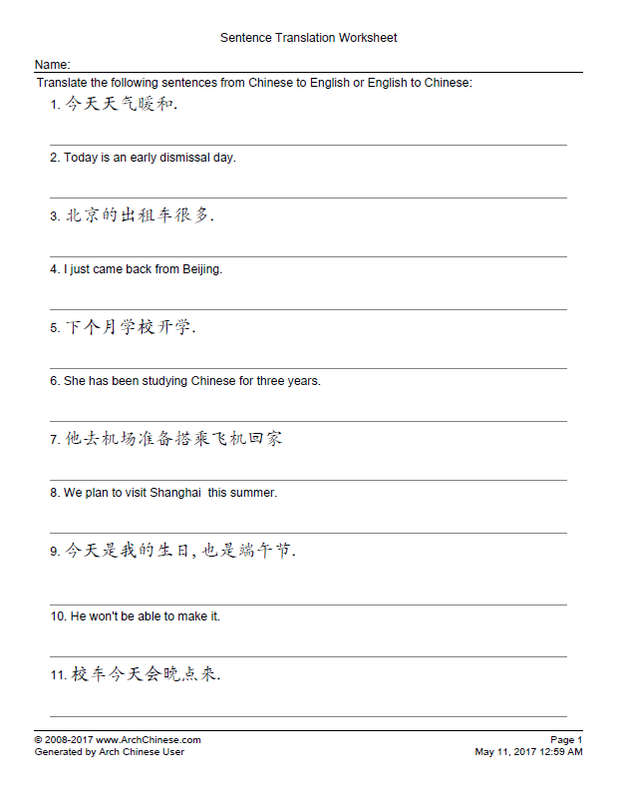 The students can use the worksheets to translate sentences from English to Chinese, or from Chinese to English. For English to Chinese translations, you only need to provide the English part. Likewise, for Chinese to English translations, you only need to provide the Chinese part. In order to save the sentences you entered for future use, each sentence is required to have Chinese part. It is recommended to enter both Chinese and English and then change the Setting #2 to generate either Chinese-to-English translation worksheets or English-to-Chinese translation worksheets. If you want to generate a translation worksheet with some Chinese-to-English translations and some English-to-Chinese translations, you need to select "Auto" in the Setting #2 with some sentences having only Chinese part and some sentences have only English part. Enter the title of the new worksheet, such as Chinese Homework #1. The title will be shown at the top of the generated worksheets. It is also used to identify the sentence list when you save the list to the server. For each entry, enter the Chinese sentence if you want your students to translate the Chinese sentence to English. If you want your students to translate the sentence from English to Chinese, make sure "English to Chinese" is selected in the option #2 on the Settings view. You can provide Pinyin for the sentences, but they won't be used on the worksheets. Click the Add Rows button to add more rows. Empty rows will be ignored in the generated worksheet PDF. Optionally, change the default worksheet settings. The settings are self-explanatory. Click the color buttons to bring up the color pickers for Chinese and English text. Click the Print button to generate a worksheet. Click the Save button to save the sentences you entered for future use.